Music is an active part of the ministry of First Churches. We have a volunteer choir which sings at Sunday services from September through June. The choir meets to rehearse on Friday evenings from 7:00 – 8:30 p.m and on Sunday mornings at 9:15. We sing a variety of music, ranging from the classical repertoire to gospel and contemporary selections. We enjoy our time together very much, and we are always happy to welcome new members! We perform one major work each spring in cooperation with the Williamsburg Congregational Church. Our choirs have joined to sing cantatas by a wide variety of composers, including Mozart, Schubert, Faure, Cherubini, Haydn, Leavitt and Rutter. This is something that both choirs look forward to each year. We also have a Handbell Choir which meets to rehearse for special occasions throughout the year. We have a three-octave set of Malmark handbells and a three-octave set of handchimes. The handchimes were a recent gift to our congregation in memory of long-time Bell Choir members Beatrice Fitts and Dorothy Swain. First Churches is the home of a magnificent E.M. Skinner and Son organ (1936). 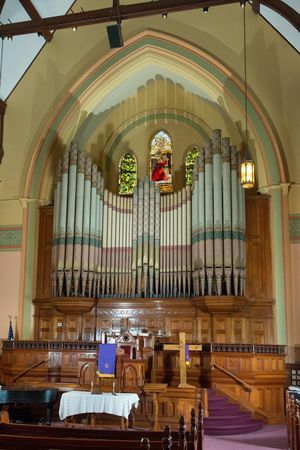 Our organ will be one of the featured instruments when the annual convention of the Organ Historical Society meets in Springfield from June 28 –July 3, 2015. The organ is serviced and maintained by Czelusniak et Dugal of Northampton. First of all, I’d just like to say how grateful I am to have the opportunity to play such a beautiful instrument. When I came here with the First Baptist Church in 1988 and first sat down at the console, it was an overwhelming experience. I felt that it was somewhat like sitting at the controls of a huge jet-liner, but, under Janet’s expert guidance, I soon came to feel at home. The work that is needed on the organ has to do with the releathering of the wind reservoirs. The organ has a large wind distribution system that begins with the blowers located in our basement. The wind generated there is then distributed throughout the organ to the pipes behind the casework using almost a dozen wind reservoirs or bellows units. Of these nearly 12 reservoirs only three have not been restored. The deterioration of the reservoirs is due simply to time and other natural causes—since leather is a perishable material. I first became aware that there was a problem last December 23 as I was practicing for the coming Christmas Eve service. Suddenly there was a very loud noise in the sanctuary. I thought it might be coming from either the furnace or a truck on the street—it was quite an impressive sound—and hopefully not from the organ! But when I turned the organ off, the noise stopped—which was not a good sign! Bill Czelusniak and his trusty crew arrived shortly after my somewhat frantic call to them and were able to patch things together in time for Christmas! They have had to make two more calls during this past year to deal with the same issue and have basically been duct-taping the reservoir covers back together each time. Their work has reminded me of the techniques MacGyver used on the television show that I used to watch with my teen-age boys! The details of Czelusniak et Dugal’s proposal will be presented to you by the Trustees. I would just like to close with a few historical items about the organ that are of particular interest to me. The organ was built by E. M. Skinner & Son of Methuen, MA, in 1936. It is known as the Sydenham Parsons memorial organ and was a gift to the congregation from Arthur Curtiss James and his wife Harriet Parsons James. Mrs. James was the daughter of Sydenham Parsons and had grown up in this church. Arthur Curtiss James, who was born in 1867, was a speculator in copper mines and railroads. By the 1920’s he was one of the wealthiest men in America. He was a member of the class of 1889 at Amherst College, and in 1890 he married Harriet Parsons. Mr. and Mrs. James had homes in Newport, in Switzerland and in New York City. Their New York home contained a pipe organ that had been built by Ernest Skinner, and it seems likely that Mr. James and Skinner became friends. Ernest Skinner fell on hard times as the Depression hit America, and he was forced out of the organ building company he had built up over the years. He and his son then went out on their own and made their headquarters in Methuen. The organ in this church was their first major project, and Bill thinks it likely that Mr. James wanted to help his friend and therefore gave him this commission. The dedicatory recital here was played by Virgil Fox who was then a young organist just beginning his celebrated career. Our organ has a wonderful history and contributes a great deal to the beauty of our sanctuary and to the services held here. The Church began to offer a new music series, Music at the Meetinghouse, in the spring of 2014. 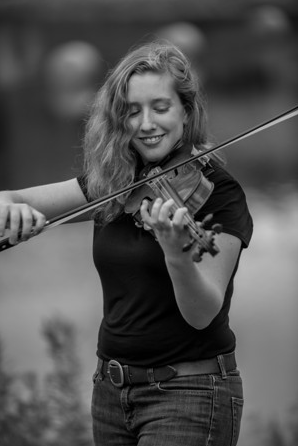 Violinist Abigail Adams performed at our first concert. The second concert, Two Flutes and 88 Keys, with musicians Gretchen Burdick, Sue Dunbar and Cindy Naughton, is scheduled for October 18, 2014. We believe that music lies at the heart of the worship service. Please contact Dana Pasquale, Minister of Music at First Churches, with any questions or comments.